Dingoes are a wild dog that is found all over Australia. It has a resident population on Fraser Island that is often spotted during tours to the island. They are mostly sandy brown in colour and are the size of a medium - large domestic dog. 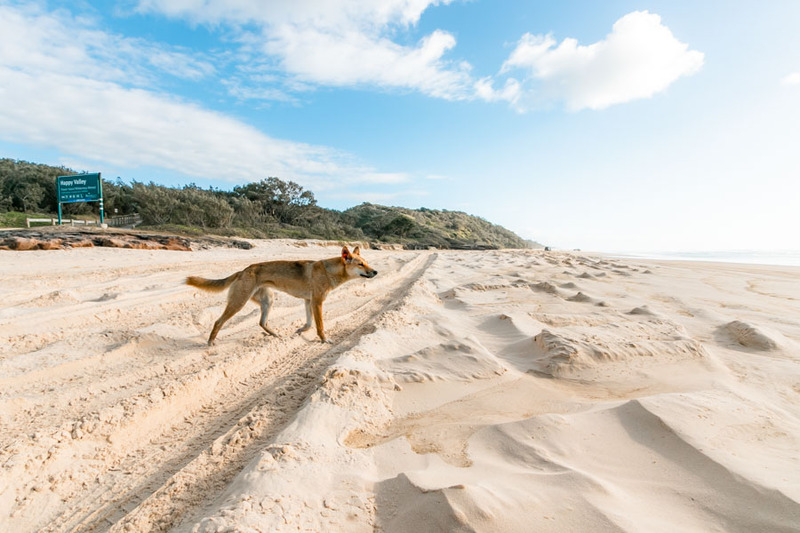 If you see a dog on Fraser Island, it has to be a dingo, as all domestic dogs are banned from visiting the island! According to recent studies, Fraser Island currently has 25 - 30 dingo packs with anywhere between 3 - 12 dingoes in each, resulting in an overall population of about 200 individuals. Each pack is dominated by a breeding male and female that rule over the rest of the pack. They mate only once a year between March and May and have pups June - August. The population on Fraser Island naturally fluctuates during mating and breeding season, but the overall numbers usually even out during the rest of the year due to natural selection and access to resources. The biggest threat to the dingo population on Fraser Island is humans. Most of the time, if a dingo meets a premature death on Fraser Island, it is the result of human interaction. Dingoes are euthanized on occasion due to adverse interactions with humans, and have been known to die as a result of vehicle strikes. On occasion, they have been poisoned by humans in a cruel and inhumane means of population control (this is highly illegal). They are closely monitored, as they are people who attempt to interact with them. It is illegal to interfere with dingoes or other wildlife on Fraser Island. This means you are not allowed to approach, feed , pet or do anything else with dingoes, aside from admiring them from a distance. Even throwing them a bit of food can cause a catastrophic chain of events that may lead to the death of that dingo or even possibly a human. Take special attention of dingoes when visiting Fraser Island. They are a vulnerable species with a decreasing population globally and must be protected. You can do your part by maintaining your distance from them and refraining from interacting with them in any way.